In Historia the players guide their civilization through 12000 years of human history, from the first sparks till the development of Singularity. Civilizations discover new technology and expand over the planet. Trade with more developed neighbours to import new technologies or exploit the land to have more power for the future actions. Civilizations develop their military and wage wars each other. Build your wonders to make your civilization stand above the others and to attract tourists in the late game, follow your Leaders and use your national Advisors. Historia is a civilization game for 1 to 5 players easy to learn and to play. It takes 25 minutes per player to play with hand management, simultaneous action selection mechanics and reduced downtime. 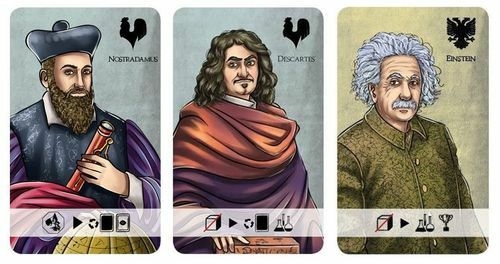 A set of action cards is available to the players to guide their civilization. Used actions form a discard queue from where they are taken back into players hand during the game. Wars and raids are carried out in a non-disruptive way. When modern times are reached or the Singularity technology has been developed, the game ends and the winner is the player with more VP. A solo variant with A.I. bots is also available. 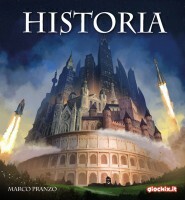 Add a Review for "Historia"